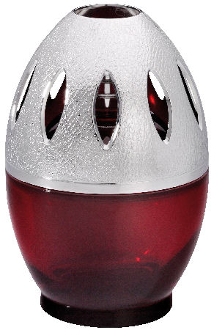 This is a beautiful egg shaped lamp with a burgundy colored glass base and a large metal top. Its classic shape will enhance almost any decor. The lamp comes in a nice Lampe Berger gift box with burner, funnel, large metal top and instructions.